Your fundraising efforts spark the conversations that inform our communities of the importance of suicide prevention while creating the resources necessary for AFSP's research, education, advocacy, and support programs. An early start is the key to success, so we're providing some incentive for you to launch your efforts right away. Pick up your official Out of the Darkness Community Walk t-shirt at check-in the day of the walk AND we'll also mail you a limited edition Out of the Darkness Walk Baseball Cap. This gray ball cap is constructed of a lightweight brushed cotton twill with a low profile six panel structure. Features a curved bill and two piece hook and loop closure. One size fits most. 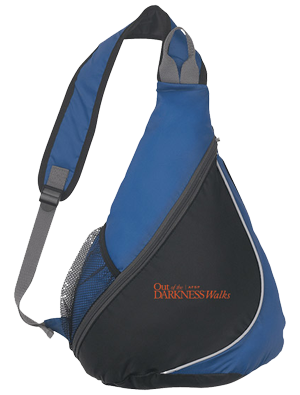 You'll earn an exclusive Out of the Darkness Walk Tote Bag**. 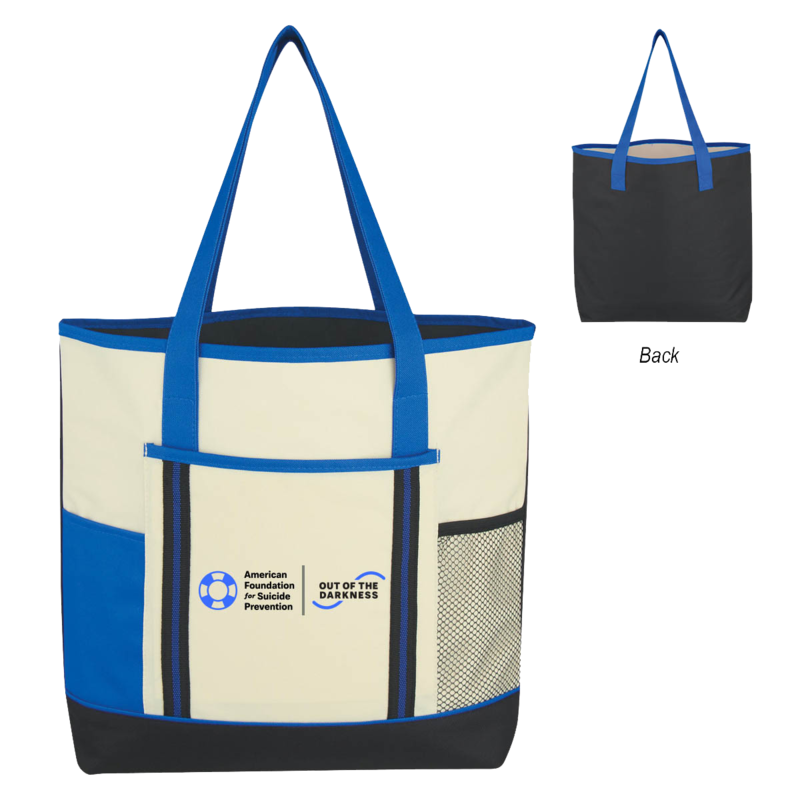 This tan, black, and royal blue tote is constructed of 600D polyester and features a large open front pocket, front/side mesh pocket, and 24” handles. Item measures 17”W X 14.5” H X 3.5” D.
After June 30th, these items are no longer available, so take advantage of this early fundraising challenge and get yours today. Gifts will ship to all qualifying participants 4-6 weeks after June 30th deadline. Please be sure to verify that your mailing address is up to date on your account. Donations for fall walks are accepted through December 31st. Offer valid for fall 2018-spring 2019 Out of the Darkness Community Walk registrations, only. Don't forget to log in to your account and click "Walker Central" for even more tips and tools to help you reach your goal. 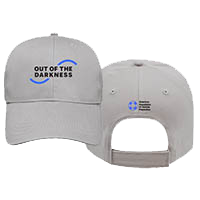 *Each individual participant (including team captains) who raises $150 or more by end of business on June 30, 2018 will receive an Out of the Darkness Walk limited edition cap, shipped to the address provided upon registration. **The exclusive Out of the Darkness Tote Bag will be awarded to the team captain only based on a combination of valid names and email addresses for 6 team members (including captain) and a team total raised of $250 or more by end of business on June 30, 2018. Team count and total raised requirements must both be met in order to qualify. Team members' email addresses subject to verification. The performance shirt will be shipped to the address team captain provided upon registration. All gifts will ship approximately 4-6 weeks after the promotion deadline.